Can everyone take a Balloon Ride? Where does the balloon land? The balloon flies with the wind, which determines direction and distance, so the flight paths differ from flight to flight. Where does the balloon take off from? How long does the balloon ride last? The actual flight lasts about one hour. Depending on how long you want to enjoy your Umbrian breakfast and wine tasting, the tour lasts about 4 to 6 hours. Where and at what time do we meet? The meeting place is Cantina Dionigi (on Via Madonna della Pia, 44). The meeting time could be as early as 6:30 a.m. in June or as late as 7:30 in September. Please contact us for full details of our balloon ride gift vouchers. What happens if the weather is unsuitable and the flight is cancelled? For your safety, all flights are weather permitting. In case of weather cancellation by Balloon Adventures Italy we shall book you in for another convenient time or you can receive a full refund if you wish. When do you fly the balloons? The morning provides the best flying conditions. The cool and serene ambience enhances the breathtaking views and incredible landscapes. The actual balloon flight time is approximately one hour. Weather permitting, we fly 7-days-a- week from May until the end of September. Can I reserve my balloon flight online? You can reserve your flight online and also pay online. If you prefer you can make a reservation by email at info@balloonadventures.it . You may also phone us on +39 3663140558 . 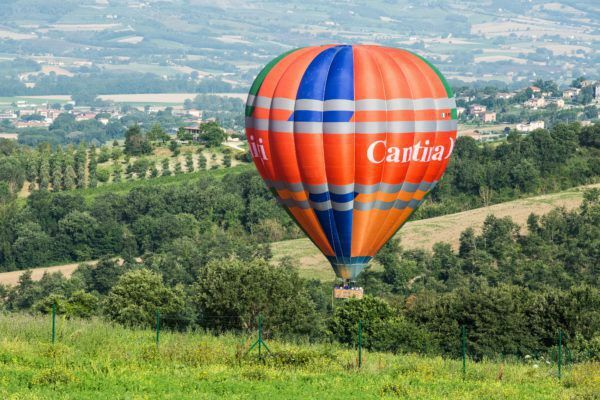 Your hot air balloon ride over Umbria is €195 for adults and €140 for children, including breakfast and wine tasting. If you need transportation from your accomodation, there will an extra charges.